Justice Department faces court action over secret tracking memos. The Justice Department is under new pressure to release secret memos that have guided its policies on covert tracking tactics. On Thursday, the ACLU is set to argue in court that the DOJ should be forced to disclose the legal interpretations used by the government to conduct forms of clandestine location surveillance. The memos in question are particularly significant because they were authored following U.S. v. Jones, a landmark Supreme Court ruling in 2012 that forced the feds to seek a search warrant in most cases before attaching a GPS tracking device to a vehicle. However, the Jones ruling did not apply to cellphone tracking, which the DOJ still insists it can do without a warrant—even while some states have enacted laws banning all warrantless tracking, and federal courts have handed down conflicting opinions on the issue. The case, of course, comes at a crucial moment for the Obama administration. It has been forced to defend its surveillance policies in recent weeks following a series of leaked secret documents on domestic and international NSA spying. A particular focus of controversy during the backlash over the NSA leaks has been the administration’s heavy reliance on secret legal interpretations of the law to justify its actions, which is apparent not only in the realm of covert surveillance but also in the domain of drone strikes. Responding to criticism about excessive secrecy, President Obama has said that he is committed to greater transparency on national security and will work to release more classified documents. Making public the tracking memos would surely be as good place as any to make a start. 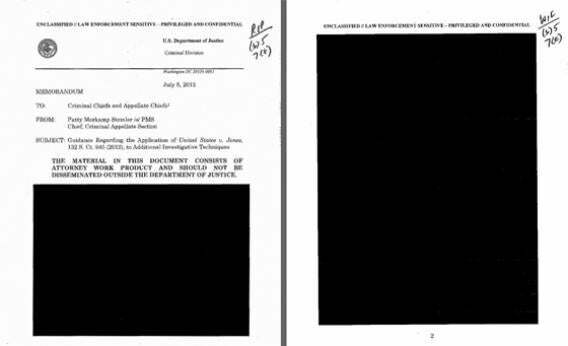 Update, Aug. 15: On Thursday, the judge in the case ordered the government to provide him with a copy of the full, unredacted tracking memos so that he can review them and decide next steps. The government had argued against this course of action, so the judge’s decision marks a small victory for the ACLU. The Justice Department has until Monday to turn over the memos, according to the civil liberties group. I’ll report further developments as and when they happen.